So many serious things to consider lately; I want to talk about something FUN! 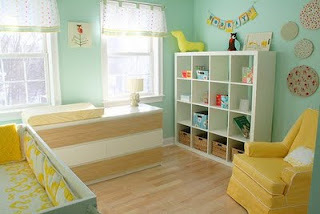 :) So, I thought I'd put up some of my ideas that I've had for baby/toddler rooms! Dear Hubby and I are building a new loft-type condo (should be done within the next two months, actually! ); so, I've been thinking about decorating and how I want this new home to "feel" more and more with each passing day. We've done a lot of research, and all along the way I've been thinking of how I'd like our little girl's nursery to look one day as well. I have tons of ideas, but I tend to gravitate toward urban hipster/shabby chic looks for her room. I love bright colors, though, so, her room won't be a straight-forward interpretation of either of these design esthetics but rather a sort of mish-mash of as many bright, vintage-y, girlie finds as I can conjure up! Many of the pictures below are from one of my FAVORITE baby blogs http://www.spearmintbaby.blogspot.com! The writer is always finding so many adorable baby and toddler goodies; every day there's something new to oogle! So, here are a few of my favorite finds that I hope to recreate in our little one's future nursery! I love the big, beautiful "puff" balls made of tissue paper in this room! So, I went and bought these (below) in all different shades of pink for the nursery (one day)! 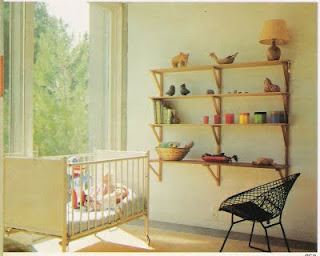 I love the simplicity and modern design of this baby nursery! Oddly enough, it is a photo discovered by Spearmint Baby's writer and is from the 1970's! Who knew?! I hope to stay classic and minimalistic like this room...we'll see if I can make it happen someday! 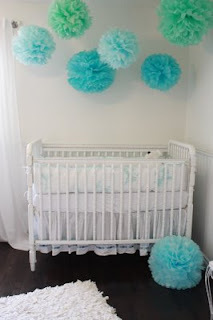 Another featured nursery from Spearmint Baby that I LOVE! Look at those colors!!!!! So beautiful! I love the colors of this room! It's neutral with a splash of bright, bold COLOR (which I absolutely LOVE)! I even love the robot, but I don't think we'll be following a theme like that for our daughter's room since we want to keep it pretty girlie. 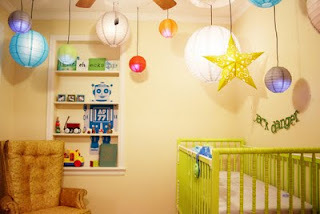 This picture also came from Spearmint Baby; and I love that the little boy who occupies this room is named "Jack Danger"(you can see his name in the banner hanging over the crib)! I love unique names; so, that takes the cake! Bravo to his mom and dad!!!! No little girl's room would be complete without some dolls around, right?! The first doll is one that Dear Hubby and I bought from e-bay.com back when we were still thinking we were going to be adopting from China. We scoured the Internet looking for Asian Cabbage Patch dolls - ha! Good luck! Finally, after months of searching, we found ONE seller and bought this little cutie up! After we decided to switch countries to Ethiopia, I was given the second doll as a gift. It was fun for me too, because when I was a little girl, my first Cabbage Patch Doll was black and looked almost exactly like this one! These are just a few of our ideas for our future daughter's room, and we're years away from this becoming a reality; but I have to say that every little idea and project invested in her (even this far in advance) makes me really excited! I can't wait til the day that we're actually painting the walls and putting a crib together - *ah bliss*! i'd like to know where you bought those puff balls.